Defending pair, if they win the ball and can get to the other grid in possession, they get 10 points. Attacking team, if they get 5 touches and move to another grid in possession, they get 5 points. - Defenders need to be aware and ready to defend. Read the cues that tell you what is happening. - Apply presure TOGETHER immediatelly! 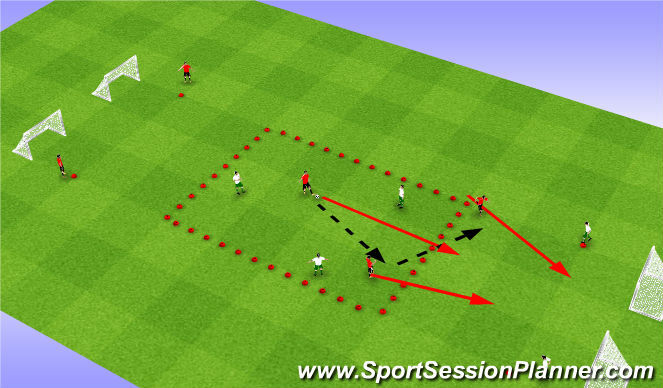 - Back 4 defenders are on cones in a high position, 2 other defenders are facing off against 3 attackers in a possession grid. 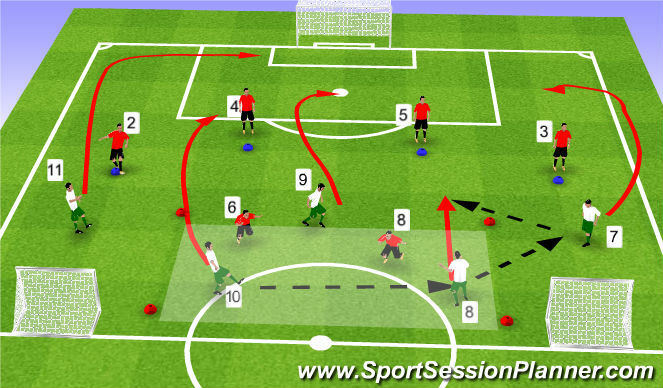 After attackers connect 3 passes they go to goal along with 2 other attackers out wide. 2 defenders in possession zone cannot help defend once ball leaves zone but they can help score in small goals if defenders win the ball and find them. - Backline scores a point by not letting the attackers get a shot off and score 3 points by hitting pugg goals. Attackers score 1 point by getting a shot off and 3 points by scoring a goal. - Defenders, read the cues that an attack is mounting By reading those cues you can get your body set and ready, you can set up and organize, and you can make play predictable.